This video explains the integrated, multi-faceted approach of the R4 Rural Resilience Initiative. R4 participants recieve an insurance payout. © WFP/Mathieu Dubreuil. There are 795 million hungry people in the world, with 232.5 million (20 percent) living in the African continent. In Sub-Saharan Africa over 70 percent of these food-insecure people rely on agriculture for their livelihoods, mostly practising smallholder farming. Smallholders feed 80 percent of Africa’s population, despite widespread poverty and chronic food insecurity. Climate change will only exacerbate this challenge by increasing the frequency and intensity of climate hazards. To address this challenge, WFP and Oxfam America launched the Rural Resilience Initiative (R4) in 2011. R4 enables food-insecure rural households to manage weather vulnerability through a comprehensive risk management approach that can be integrated into national social protection systems. strong presence of Oxfam America and WFP programmes. This case study report is targeted at practitioners within WFP and other humanitarian and development organizations, alongside governments and donors, to help outline how to implement risk management, risk finance and risk transfer projects; to better understand agriculture risk management schemes; and to raise awareness on innovative solutions in the food security, climate change adaptation and resilience fields. *The full report is available for download in the right-hand toolbar. R4 builds on the Horn of Africa Risk Transfer for Adaptation (HARITA) initiative, founded in Ethiopia in 2009 by Oxfam America, the Relief Society of Tigray (REST), the International Research Institute for Climate and Society (IRI), the global re-insurance company Swiss Re and a number of national partners. The R4 model (figure 1 from page 6 of the report). Improved resource management through asset creation (risk reduction). by paying with their labour through Insurance- for-Assets (IFA) schemes. When a drought hits, compensation for weather-related losses prevents farmers from selling productive assets and stimulates faster recovery. schemes, or into WFP’s Food Assistance for Assets programme. Assets built through risk reduction activities promote resilience by steadily decreasing vulnerability to disaster risks over time. By protecting farmers’ investments in case of a bad season, R4 enables households to invest in riskier but more remunerative enterprises, as well as in seeds, fertilizers and new technologies to increase their agricultural productivity. Participants establish small-scale savings, which are used to build ‘risk reserves’. 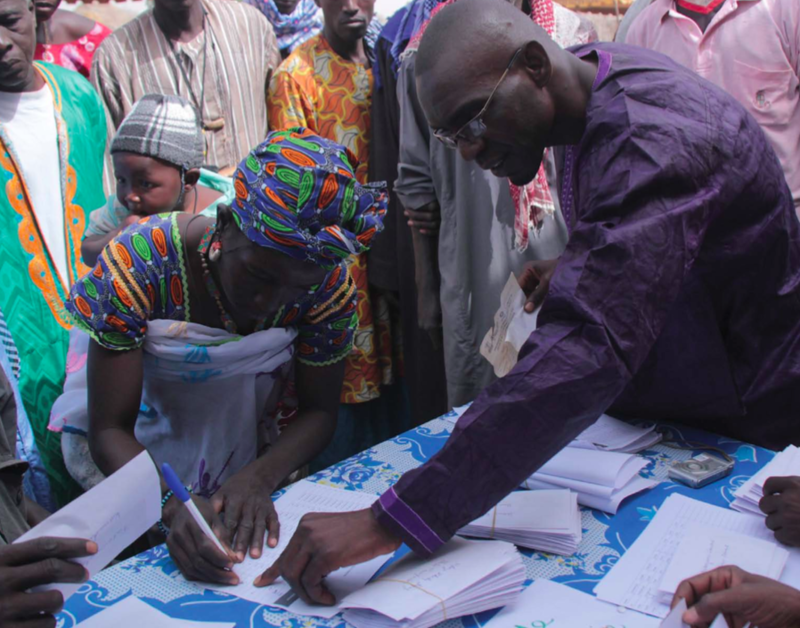 In Senegal the initiative leverages Oxfam America’s Saving for Change (SfC) programme. Savings help build a stronger financial base for investing – but also act as a buffer against short-term consumption needs and idiosyncratic shocks, such as illness and death of a family member. To ensure long-term sustainability, R4 contributes to the creation of rural financial markets, by building the capacity of farmers, local insurance companies, and micro-finance institutions and gradually transitioning farmers to pay for insurance in cash. building strong savings and credit mechanisms (Saving for Change). The development of R4 in Senegal would not have been possible without the active involvement of a number of actors. At the international level, partnerships exist between Oxfam America, the International Research Institute for Climate and Society of Colombia University (IRI) and WFP. Roles and responsibilities of each one of the partners takes each organization’s strength and expertise into account to build a ‘best in class’ model. At the national level, WFP and Oxfam America work with several implementing partners across the four components of R4 in Senegal, including the former PAPIL (Projet d’Appui à la Petite Irrigation Locale), now P2RS (Programme multinational de renforcement de la résilience à l’insécurité alimentaire et nutritionnelle au Sahel - composante Sénégal), Bamtaare services, La Lumière (a local NGO), and the agricultural insurance company Compagnie Nationale d’Assurance Agricole du Sénégal (CNAAS). The Senegalese Government is also providing a 50 percent subsidy for the insurance premium provided to R4 participants, among other activities. Design challenges: The process evaluation found that assumptions in the R4 project design regarding communities’ resilience challenges in Koussanar were largely accurate, with poverty and climate-related food insecurity issues as the top priorities. However, communities did not necessarily identify climate-related shocks as the main cause of poverty or food insecurity, putting more emphasis on access to education and quality sanitation coverage as major concerns. Forced early marriages, which cause girls to drop out of primary school, was also often mentioned as a cause of poverty, an issue that had not appeared in the initial context analysis. Communities additionally underlined the importance of improved social cohesion and appreciated R4’s efforts to support local solidarity mechanisms. Asset creation activities: The success of the asset creation projects depends on the existence of strong implementation partners that have the right capacity in terms of human and logistics resources. In Ethiopia, one strong partner in each region exists and coordinates all components; in Senegal the WFP-Oxfam America team played a critical role in pulling together the right capacities and coordination among multiple partners. A further lesson has been the importance of investing in training communities through learning-by-doing sessions on the technical aspects of asset building and agricultural production has a key element to ensure the longterm sustainability of the programme. Developing a reliable monitoring system has also been key for the programme to work. Insurance index design: Creating an index insurance scheme is a complex process that for the present time could not be done without the involvement of international institutions such as IRI. Mainstreaming this approach at the national level will need a strong emphasis on building local capacity of public and private institutions. rural households in the regions of Kaffrine, Kolda, Tambacounda, Fatick, Kaolack by building their resilience to increasingly recurrent climate shocks, and adapt to the adverse impacts of climate change. Globally, R4’s goal is to empower over half a million food-insecure people to improve their lives and livelihoods in at least four countries in five years. In 2015, the team started piloting R4 in Malawi and Zambia; other countries currently being considered are Kenya and Zimbabwe. R4 will be rolled out in each new country over a period of three to four years, giving enough time and data to conduct impact evaluations, monitor progress and improve the programme’s implementation based on regular feedback from participants and key stakeholders. This report was co-authored by Daniel Longhurst, Kathryn Milliken, Fiona Guy, Azzurra Massimino and Mathieu Dubreuil and with valuable contributions from Fabio Bedini, Carla De Gregorio and Giorgia Pergolini. WFP (2017) The R4 Rural Resilience Initiative in Senegal. World Food Programme: Rome, Italy.